Shamrock Auction co-chair Ann Kissane contributed to this week’s column. The Shamrock Auction started 17 years ago and continues to be one of St. Patrick School’s largest fundraisers. All proceeds are split between the Athletic Association and the school general fund. Since its inception, the auction has raised almost one million dollars. This year’s event is scheduled for Saturday, April 27 at the Knights of Columbus Hall and doors open at 6 p.m. This year’s theme is “Hawaiian Luau.” The entry fee of $20 includes a buffet meal and free drinks for the entire evening. Tickets may be purchased using our new online software at www.bidpal.net/shamrockauction2019 or at the school office. In addition to the live auction, there will be several fun-filled raffles, 50/50 raffles, and a silent auction, which runs from 6-9:45 p.m. This year, all bidding for silent auction items will be done through our new software straight from your phone or device. No more waiting in line to bid on the items you want! The live auction begins at 8 p.m. and is loaded with fabulous items such as tickets to see Hamilton in Chicago, club seats to both the Tigers & Redwings, and even an opportunity for a Portland Fire truck to pick your child up from school. You also don’t want to miss the lower elementary class projects or the themed baskets from our older students. But the fun doesn’t stop there – there are also a few new experiences at this year’s event! One of them is the addition of a Giving Center to support our newest Shamrock – Father Mike. At this center you will be able to help us raise money for new priest vestments. Also new this year, after the live & silent auctions are complete, you are encouraged to stay for our after-auction social which includes music and dancing. Local favorite Skip & the Dude will be performing. The Shamrock Auction is an event that truly brings our school families, alumni, parishioners and school supporters together. It requires a lot of hard work and a huge commitment of time from many people. But it pays off greatly—not only in the money that it brings into the school and athletic programs but as a wonderful social event, enjoyed by hundreds. Its success stems from a great volunteer committee and the dedication of parents, family, friends, alumni and the support of many local businesses! If you would like to donate an item to be auctioned or to make a cash donation, you may drop either item off at the school office during regular office hours. If you are unable to attend the Shamrock Auction you can still support St. Patrick School by making a donation through our online portal (www.bidpal.net/shamrockauction2019). Or use this link to purchase a tuition raffle ticket – the winner will receive 50% off their first child’s tuition. In the meantime, mark your calendars for April 27 and plan on a great evening of entertainment, socializing, and fun! We hope to see you there! It is time to begin preparing for next school year already, and that means it is time for kindergarten screening. For many parents, especially those with a child entering school for the first time, this is a time of great excitement, and potentially great anxiety. We hope you were able to attend our open house that provided a lot of great information; if not, that is okay too. Our experienced staff is prepared to help you through this process. Kindergarten screening for St. Patrick School will be held on Friday, April 26. The screening takes from 45 minutes to an hour. Call the school office at (517) 647-7551 to make your appointment. We use the Gesell Developmental Observation (GDO), which is a standard procedure for observing a child’s growth and development. This assessment is conducted by a trained examiner who makes observations of a child’s behavior and then compares these observations with normative patterns for each developmental age. The GDO does not have right or wrong responses, but instead provides a composite picture of a child’s developmental age, his or her individual rate of growth, and his or her integrity in the total growth process. The Gesell Institute recommends that every child receive a developmental screening to create a picture of where he or she is at in their unique process of growth and development. Children who attended our developmental kindergarten program for the current school year will not be screened again before entering kindergarten. If your child is shown to be ready for kindergarten we will place them in kindergarten, unless you request differently. If your child screens for DK, they will be placed in that class. We will not advance students to kindergarten if the screening shows they are not ready; we want to place students in a class where they will succeed. The GDO has proven to be very accurate over the eleven years I have been an administrator at St. Pat’s. If you have further questions in regard to St. Patrick’s DK or kindergarten programs, please call me at (517) 647-7551 or email randyhodge@portlandstpats.com. We welcome you to schedule a visit so you can see our classrooms and meet with your child’s teacher. You will not be the first or only person who has done this. Kindergarten screening is a time to celebrate the next step of your child’s development. Give us a call and let us help you with that celebration! St. Patrick School is always looking for ways to keep our students safe and informed while trying to look out for their health and long-term well-being. It is especially exciting when we have an opportunity to present this message in a fun and exciting manner. We were blessed that funding became available for St. Patrick School which allowed us to bring in a special presenter, Mr. Jim Basketball Jones. The funding for this presentation was provided by the Ionia County Substance Abuse Initiative (ICSAI), the Ionia County Health Department and Mid-State Health Network through a very generous grant. On Monday, March 25, St. Patrick School hosted Mr. Jim Basketball Jones. Basketball Jones is an experienced inspirational speaker who has been traveling the country bringing a positive and upbeat message to students in more than 7,500 schools throughout the United States. His career started while still a high school student when the Cleveland Cavaliers invited him to perform at halftime during their basketball games. After he received his business degree, he chose to use his unique basketball talents to travel the country and provide an inspirational message to students. Do not use drugs or put other unhealthy substances into your body. He provided examples about how drugs can negatively impact our brains. He encouraged students to be kind to one another, to lift each other up and be supportive of one another. He told them they should never be negative or mean to others. He shared with students how he overcame the struggles of being a learning disabled (LD) student and told students to continue to work hard and overcome any difficulties they may face in life. He reassured them that they have the God-given ability to be successful in whatever they endeavor to do with their lives. He told students to resist peer pressure if they were being encouraged to make decisions which they know are unhealthy or inappropriate. He also encouraged the students to have fun and enjoy life! While providing the students with his positive message, he performed a plethora of basketball tricks. He called many students forward to be active participants throughout the assembly. Students enjoyed the opportunity to assist and be engaged in these activities. The highlight of the elementary assembly was an active and engaging dance off between students and the highlight of the secondary assembly was an intense game of Simon Says. We appreciate the grant that was provided to St. Patrick School and the opportunity to have Mr. Jim Basketball Jones perform his tricks and provide his message to our students. Students face many challenges in life, and it is truly appreciated when we can reinforce the positive message our students receive from both school and home about how to be successful ambassadors for Christ. On March 20, St. Patrick student athletes, their parents, and the winter sports coaching staff gathered at the Knights of Columbus Hall for our annual Winter Sports Awards banquet. The purpose was to celebrate a successful winter sports season. This event is graciously hosted by our Athletic Association every year. I personally believe a school’s sports programs and the students involved in those programs should represent the goals and values being taught in the school’s curriculum. With that as the standard, our student athletes accomplished all that could be expected of them and more during the winter sports campaign. They exemplify the third part of our mission statement: We Achieve! Marian Pearson finished 15th in the state in individuals. Stephen Wernet was named as the Brandon Vanderbrook scholarship winner which is awarded to the bowler which exemplifies the characteristics displayed by Brandon when he was a bowler in high school. The JV boys basketball team started out slowly but improved as the season went on picking up momentum and finishing with a three-game winning streak. Brandon Scheurer: 1st team CMAC, Academic All-State, Honorable Mention All-State, and he scored his 1,000th career point during the season. The JV girls basketball team had an outstanding season only losing to one other school all season and finishing with a record of 16-2. Most importantly, our student athletes worked hard to maintain their grades and demonstrated good sportsmanship throughout the season. All in all, I am very proud of the way our student athletes represented our school both on and off the court and lanes throughout the season. Their strong work ethic, commitment to success, positive attitude, and teamwork propelled our teams to a successful winter sports season of which they can be very proud. Our student athletes have been exemplary examples of what we expect at St. Patrick School. Congratulations, teams for a job well done! It teaches children about the world around them. It develops a child’s imagination. It is a great form of entertainment. It relaxes the body and calms the mind. Knowing how important it is to make reading exciting for our students, our teacher committee at St. Patrick School has been busy preparing special activities for our elementary students for this month. While we are hosting some of our traditional reading month activities such as guest readers in the classroom, we had a new and exciting opportunity this spring. We partnered with a group called Buddy’s P.A.L.S (Pet Assisted Learning Services). Buddy’s P.A.L.S is a non-profit organization lead by Ms. Lolie Fabela. 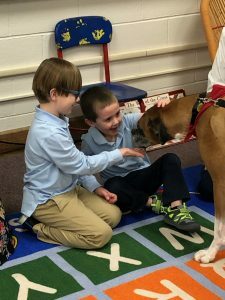 On March 5th, we had a special visitor, Zeke, a four-year-old boxer, come to St. Patrick School with his human, Ms. Starr! 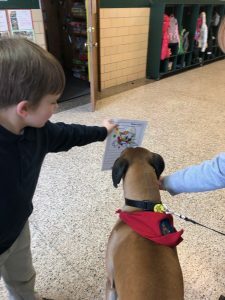 He helped us kick off “Paws” to Read, which is our March is Reading Month theme. As he went from classroom to classroom, he uplifted everyone with smiles and great spirits. He brought out some fine moments from students and staff. We are very excited about the Reading Month activities. We challenge parents to further support these efforts by encouraging reading at home all year long. We also challenge you to pick up a good book for yourself as well as take time to read with your child. We hope you will continue to support us in our reading and literacy efforts. St. Patrick School invites any prospective students and their families to come visit and attend an open house on Sunday, March 24 from 12:30 – 2:30 p.m. The open house is for students who will be in any grade from preschool through the 12th grade for the 2019-20 school year. The open house will allow individuals or families the time to come and take a tour the school and visit classrooms; speak to teachers and current families; explore the curriculum and speak to teachers about their grade level or subject area; and finally, the opportunity to learn more about the extracurricular activities offered by the school. Members of the school administration, St. Patrick School Board and the teaching staff will be present to answer any questions you may have. St. Patrick Catholic School has been expanding programs such as their STEAM curriculum and dual enrollment classes allowing students to earn college credits both on and off campus. As the only Catholic school enrolling pre-school through 12th grade in the county, St. Patrick Catholic School is open to students residing in Portland, as well as from neighboring communities. One does not need to be Catholic to attend St. Patrick School. Founded in 1909, St. Patrick Catholic School has a great tradition of academic success evident in its graduation rates, test scores and the number of graduates participating in collegiate level studies as well as educational & training programs after high school. The school enrolls 370 students and serves preschool through 12th grade all in one building. More information can be found at www.portlandstpats.com, on the school’s Facebook page and Twitter. When attending the open house, please enter through the main office doors on Church Street. There is parking available in the parking lot located between the church and the school and overflow parking is available across Church Street by the parish office. We look forward to meeting and showing your family around St. Patrick School on Sunday, March 24 from 12:30 – 2:30. If you have any questions, please feel free to contact the school office at (517)647-7551. Lent, from the Middle English word Lentum, meaning springtime – the time of lengthening days, is a period of 40 days of fasting, prayer, and penitence before Easter. Lent begins on Ash Wednesday, March 6 this year, and ends at sundown on Holy Thursday, April 18 this year, when the Paschal Fast begins. Lent offers us all a special opportunity to grow in our relationship with God and to deepen our commitment to a way of life, rooted in our baptism. It is an opportunity to reflect on our lives, pray more deeply, repent of the wrongs we have committed or in what we have failed to do, and to be charitable to those in need. Stations of the Cross: Each Friday during Lent, students will come together and pray the Stations of the Cross. The Stations of the Cross are a Catholic devotion which commemorates the passion and death of our Lord Jesus Christ. Each of the fourteen traditional stations represents an event which occurred during Jesus’ passion and death on Good Friday. Operation Rice Bowl: Middle school students put the Rice Bowls together and study some of the areas around the world and discuss how this program will help those affected areas. On Holy Thursday, the staff will serve our students lunch and the students will donate that day’s lunch money to the Rice Bowl. Preschool students will be talking about and reading age appropriate books about Lent and Easter. Each day they will have a Lenten activity. They will collect coins throughout the Lenten season and the money will be donated to the Rice Bowls. Students individually commit to fasting or performing acts of Christian service. While students will not be attending Reconciliation as a class, secondary students have opportunities to receive this sacrament throughout Lent by attending during parish times. Each Wednesday at noon, Fr. Mike will be in the confessional. With parent permission, students in grades 6-12 may sign out of school and go to confession. Fr. Mike will also be in the confessional on Fridays at 2:30 so students may attend on their own after dismissal. Fr. Mike encourages all students in the 2nd grade or older to attend Reconciliation with their families during the times that have already been mentioned or on Saturdays at 9 a.m. and 3 p.m. Lent is a time for all of us to focus on repenting from our sins and consecrating ourselves to God, not on trying to earn God’s favor or increase his love for us. It is our goal that all our student body and faculty be well prepared for the resurrection on Easter. • Recently, we found out we were the recipients of a Michigan State Police Safety and Security grant in the amount of $100,000. We appreciate that a parent took the time to apply for this grant which will allow us to provide upgrades to the infrastructure of our building. • An anonymous donor has stepped forward with a generous donation to upgrade the sound system in our school gymnasium. We are also going to look at the possibility of making other improvements to our stage area once the new pole building is completed at our athletic complex and the weight room is moved to the new facility. • Through several generous donations, we are hoping to have our entire high school travel to Washington D.C. to participate in the March for Life in January. • St. Patrick School has had several very generous “Tuition Angels” come forward that have anonymously donated to help students be able to afford a Catholic School education. • To the many individuals who donate to classrooms which allow our teachers to purchase many items that allow them to provide a top-quality educational experience for their students. • To the many individuals and businesses who donated food and drinks to help our campus ministry team host a Thanksgiving dinner at the school on the Wednesday evening before Thanksgiving. Many people showed up looking for a good meal, good company or both. We hope to make this a new tradition at St. Patrick School. We are very appreciative to all the individuals who have generously donated to St. Patrick School and Parish this year. We would be unable to offer the high-quality education and provide the many opportunities that we do if it were not for all of you. Many projects have been accomplished this year, but there is still more work to be done. If you would like to make a tax-deductible donation before the end of the year we have a few large projects that we are still seeking funding for; our pastor, Fr. Mike has made the remodeling of four of our school bathrooms as well as installing two new staff bathrooms a high priority. We also would like to install lockers in the elementary hallways which would allow for students to keep their winter clothing items separate. Installing lockers in the hallways, would also provide an opportunity for us as we look to remodel our classrooms in the future. We hope everyone had a happy Thanksgiving. We are very thankful, grateful and appreciative to all those individuals who continue to make great things happen at St. Patrick School. May God bless you and the gifts you have so generously shared with us. • Remodeling of the school bathrooms – We have four bathrooms, two men’s rooms and two women’s rooms in the original part of the building. These bathrooms are more than 60 years old. These four restrooms will be gutted (including all plumbing) and totally remodeled with the goal of doing so this coming summer. We plan on using current classroom space to also install two staff-only bathrooms at the same time. Preliminary indications are that the bathroom extreme makeover project will cost around $500,000. • New roof on the school – The roof on the parish educational facility needs to be replaced. Early indications are that it will cost approximately $250,000. • Father Flohe Foundation Endowment Fund – Currently, our school’s endowment fund is in the midst of a pledge drive. The current foundation has 2.4 million dollars and now gives $95,000 to the school annually. We would like to increase the corpus of the foundation with the goal of allowing the endowment to give off more, which will keep pressure off of driving up our annual school budget. • Shamrock Scholarship Fund – Each year we do a pledge drive to build up our annual current needs scholarship fund. There are always students in need of immediate tuition assistance, especially when things come up unexpectedly over the course of a school year such as the loss of employment, a divorce, or death in the family. This past year, we gave approximately $50,000 in scholarships while the overall need was approximately $85,000. • Chromebooks for the Class of 2023 – To continue our 1:1 implementation of Chromebooks, in which each incoming freshman class receives a Chromebook. The approximate cost is $6,000 to the school. This is one of our larger capital expenditures each year and a donation would help defer the cost from our annual budget. Each Chromebook costs approximately $200. • Create a college scholarship (any amount) – We are always looking for college scholarships to award our graduating seniors. Remember a loved one or support your alma mater and give a child the gift of a college education. You set the amount and choose the qualifications of the scholarship. We thank you for your generosity! If you are willing to fund any or all the programs listed above, we would be truly thankful! Any donations toward these projects are greatly appreciated. If you have any questions about these projects, please feel free to contact Mr. Randy Hodge at the St. Patrick School office at 647-7551 or randyhodge@portlandstpats.com. We wish everyone a very Merry Christmas and a Happy New Year! The end of the year always finds the circulation of many lists counting down the major events that happened. And before we ring in 2019, I would like to create my own list and look back at the top events for St. Patrick School during 2018. 1. We were excited that 36 of our high school students made the decision to attend the March for Life in Washington, D.C. in January. This is the beginning of our goal of having the entire high school attend. We have 50 students who have committed to attend the March for Life 2019. 2. In February, our pastor Fr. Larry King officially retired. Bishop Walkowiak named Fr. Michael Alber as our new pastor. 3. We staged a school play for the second consecutive year by performing What Happened After Once Upon a Time. 4. Our school participated in the Giant Rice Bowl project again this year during Lent raising $1,378.86 for Catholic Relief Services. 5. The Class of 2018 graduated in May. 24 out of the 26 enrolled in higher education with $270,000 in committed scholarship money. Seven had a grade point average over a 4.0 and 24 out of the 26 had one over a 3.0. 6. St. Patrick High School and Aquinas College continued with our agreement to host college classes on our campus. We expanded our course offerings adding Cultural Anthropology and Introduction to Psychology courses. 7. We expanded out 1:1 Chromebook initiative by adding Chromebooks for our 8th grade students. In 2019, our middle and high school students will all be provided a Chromebook. 8. Our girls varsity cross country team finished first in the state in Academic All-State. They had the highest grade point average of any Division IV school fielding a cross country team. 9. The varsity football team finished as state runner up this year. They advanced to the state semifinals before being ousted by a strong Onekema team. “We Achieve!” is the third and final part of our mission statement and it is evidenced by this list. Many hours of work by a great number of individuals were completed to make all of these events happen throughout 2018. We are excited about these accomplishments and are even more excited for the prospect of bigger and better things to come in 2019. Merry Christmas and Happy New Year from all of us at St. Patrick School!